January started off with an extra week off work for me, but catching up on some much needed rest, meant there wasn't a lot of time for playing ponies unfortunately... However, we'd entered a BD competition to kick the year off, so spending a week being fairly anxious as to whether the snow & ice would put a stop to it. Thankfully it didn't and we set off to a new venue for us, West Park Equestrian. Although in our area, it was a bit further away than I first thought, with some dicey moments on the icy A68 when up on the tops, but we arrived safe and sound. Things looked a bit bleak when it was snowing while I was tacking up, but thankfully it soon stopped & we were back in blue sky with sunshine! The venue had an outdoor and smaller indoor to warm up in. I opted for the indoor in case we saw anymore snow, but actually to get Louie through and forward, I think I'd have been better going outside. He warmed up lovely, but became a little insular when we headed into the arena. Missing a strong through connection meant I wasn't able to correct this as easily as normal. I was pleased that he carried on throughout his test without these areas affecting the rest of our test. It's not long ago that something like this would have upset the rest and whole of our test. The next day we had a fantastic flatwork lesson with Cathy, working on shoulder in and bringing our "training frame" to closer to our test way of going. Louie tried his heart out, and was super receptive to learning new things. The next weekend, we had a showjumping training session booked in, and as we hadn't jumped since the end of November, we thought we better put some fences out in the week leading up to it. Louie came out very level headed and as if he hadn't had a break from jumping at all! Unfortunately, the next day didn't quite go to plan...I entered the super small classes (60cm & 70cm). It's been a while since Louie went out to an arena packed with so many jumps, and he went a bit green and although not a text book round, he tried his best and watching it back, I think I'm far too hard on myself! The next round, I was more determined to be smooth, rhythmical and consistent around the course. Which was partly going to plan, but with a good effort in front of the jumps, I completely forgot about riding AFTER my jumps. At fence 10a, I felt the impact of not correctly riding...and met the ground quicker than planned and not at the point I'd planned! We'd got another training session later in the month, where we worked on riding away from the jumps when it doesn't go to plan so as not to effect the rest of the round. I've put this straight into practice at home since too. 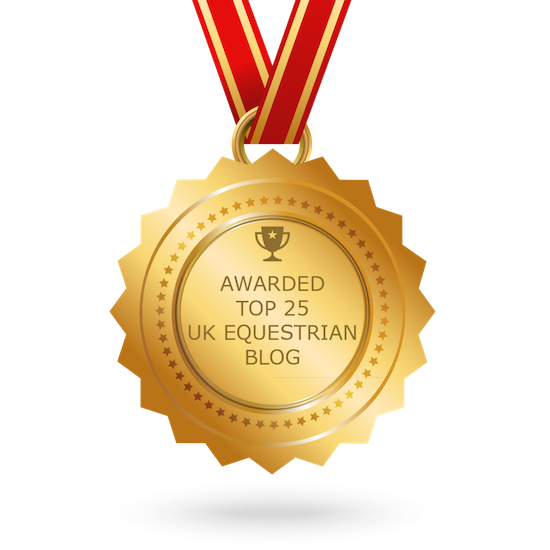 I was very surprised right at the end of January to discover that my blog is ranked on Feedspot as no.15 in the top UK Equestrian blogs!! There's some other fantastic blogs listed, so make sure you give them a read and a follow on social media! !